Painting Tulips makes fun. I love to see the tulips showing their little heads – is it warm enough to come out or is it still too cold? I love to see all the beautiful coloured tulips – yellow and red tulips, white and purple tulips. After the grey of the winter we all love and welcome these bright colours in the garden or fields or in the garden shops. 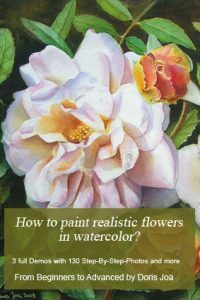 Creating paintings of tulips in oil or watercolor can be a challenge. 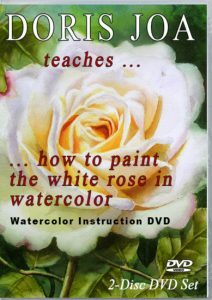 The first important point is to find a good composition if you want to paint a bunch of tulips. All tulips in your painting shouldn’t look the same. There should be one tulip which is the star of the painting. 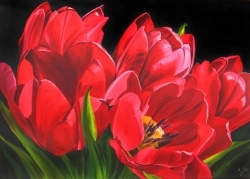 Look at my red tulip oil painting. I bought this bunch of tulips at a garden shop. I then went outside, held them in my hands as I wanted to have them hit by natural light outside and then made my reference photos. I know I wanted to have one tulip showing its beautiful inner and the rest of the tulip only should support this one special flower. Of course we are also allowed to use artistic license. We can add and suggest more flowers in the background. We only need to be aware that the light still looks correct. Adding some greens to this bunch of tulips was neccessary. Because green is the complimentary colour of red and I am sure you will agree that both colours work perfect in this painting. I decided to make a dark background because I wanted to add some drama to this tulip painting. 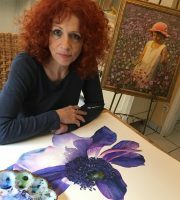 Below are some step-by-step photos displayed of how I created my large tulip painting in watercolor. Again I wanted to have a perfect composition. As I already painted some bunches of tulips I wanted to have only a few now in this watercolor painting. I made again a lot of reference photos at the same day time and in the same day light and then I choose the tulips in those photos which I liked the best. I didn’t have one perfect photo. This often doesn’t work and so I needed to work again from several photos. Those three photos were perfect to show the beauty of this tulips. There is again one main flower. 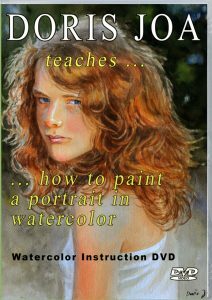 It is placed correctly in the painting so you immediately look to this colour. To make this one tulip stand out it has also the warmest colours (strong yellow/orange glowing) and also strong contrast (the yellow inner against the dark anchors). 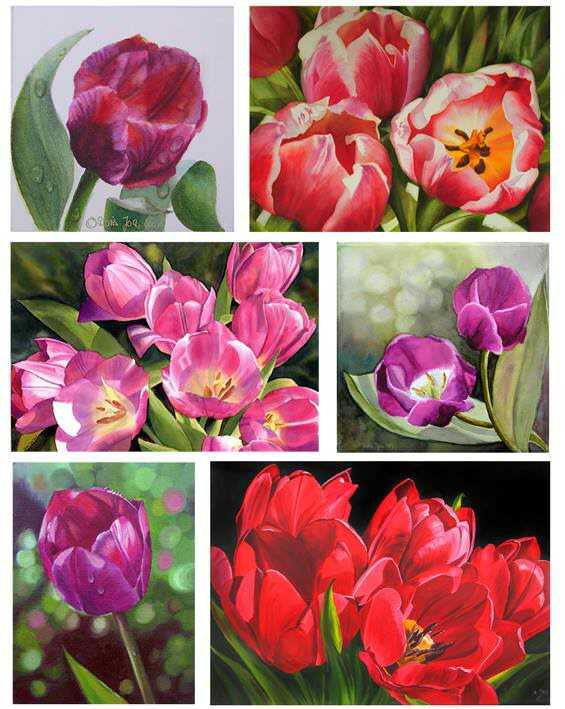 I started again with the flowers and my colours for the pink tulips were: Permanent Rose, Scarlet Red, Purple Magenta ans Cobalt Blue. Some petals are warmer in colour temperature so they got more of this Scarlet Red, others are cooler and they got more of the Purple Magenta or Permanent Rose mixed with Cobalt Blue. The highlights are cool and got light washes of Cobalt Blue. I then started with the leaves. I like a lot the contrast of the red flowers against the green leaves. 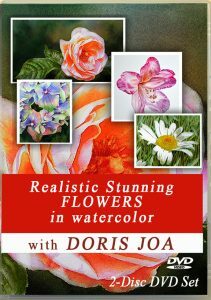 This works always perfect and nature gives us all what we want and need to create a perfect painting. The leaves in the background got later also some colour splashes from the colours of the tulips. The inner of the main tulip was created with a lot of indian yellow, translucent orange and some of Scarlet Red. I wanted to have this tulip really glowing in colour. 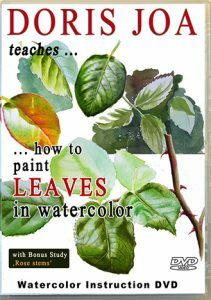 If you want to learn more how to create a complex painting with a glowing subject, supporting leaves and background then have a look at my Watercolor Video.